So far on this adventure, I have been spoiled with the ability to use English to get by in most of the countries we have visited. In Japan, however, English is much less common particularly in the smaller cities. I have been diligently practising and using my ‘arigatou gozaimasu’ (thank you), ‘kudasia’ (please), and ‘Sumi masen’ (excuse me) every day, but I was not quite prepared for my first dinner in Nikko. It was a long journey from Hiroshima to Nikko, with four different train transfers, and by the time we got to Nikko I was pretty hungry for dinner. The staff at our Hostel suggested that we try either a ramen restaurant a block away, or the izakaya down the street. 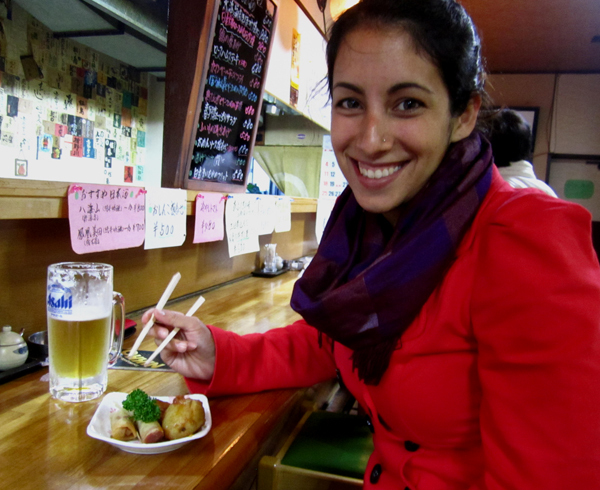 After indulging in many ramen shops in Tokyo and Hiroshima, we decided to scope out the izakaya for a change. An izakaya is essentially a Japanese bar that serves appetizers with your drinks and a common after work destination for the locals. We quickly discovered that the little old lady that ran the bar knew about as much English as we knew Japanese, and our few words that we did know weren’t going to get us very far. We managed to order some sake and beer, but without being able to read the menu we wern’t too sure what to do next. As our drinks were served, we also received a set of chopsticks each which suggested that food was to come, and as we guessed I soon had a potato and two sausages before me. They were a tasty treat, but I was stil feeling hungry. The one food word that I did know was’ gyudon’ which as our friend Paul in Tokyo taught us is a bowl of rice with beef on top. ‘Gyu’ means beef and ‘don’ is bowl. I tried to order some Gyu, but with my terrible pronunciation it was not surprising that I was not understood. It wasn’t until Tyron put his two fingers on his head like horns and butted his head that one of the other patrons said “ah cow!’ and we got our bowl of beef . Luckily the bartenders were very kind and had a great sense of humour, laughing with us as we acted like cows. And when I say beef, I mean just beef. No rice,no vegetables, just beef. We met a vegetarian couple that night who told us how the night before the only thing they were able to order of dinner was a big bowl of tomatoes. Even with all of the confusion, it was a very fun night, and we ended up with food and drink in our bellies as we watched the sumo match on TV. I was reminded the importance of learning the local language basics, or at least remembering your phrase book! As always in travelling, maintaining an open mind and a positive attitude will help you to deal with the challenges you face along the way. I wish I could have caught the moment on video! Nothing wrong with your attitude on this trip, always smiling and ready for a new challenge, cracked up laughing at your description of Tyron doing ‘bull/cow’ description. Sounds like a great meal and I love your smile in the photo. Enjoy the time with Emily and take care. It was a very memorable night!